BANGOR, Wash. - The blue crew of Ohio-class ballistic-missile submarine USS Nebraska (SSBN 739) returned to Naval Base Kitsap-Bangor, July 12, following the boat's first strategic deterrent mission since 2013. Nebraska recently completed a 41-month engineered refueling overhaul (ERO) to extend the life of the submarine for another 20 years. "Nebraska's return to strategic service represents an important milestone in the life of the ship," said Capt. Nicholas Tilbrook, commander, Submarine Squadron 17. "When the decision was made to extend the Ohio-class submarines from a 30-year ship life to 42 years, midlife refueling overhauls became an important part of that strategy. During the lengthy shipyard period, extensive maintenance is accomplished, in addition to refueling the reactor. Numerous critical pieces of equipment and systems are refurbished, replaced or modernized so the submarine's reliability and operational capabilities at the completion of the overhaul are increased. It is vital that our Ohio-class SSBNs continue their tremendous track record of operational reliability, unmatched stealth, and peerless strategic systems until the Ohio-class follow-on, the Columbia class, comes online in the 2030s." After completing the overhaul, the ship and both crews successfully completed three major certifications. The first was the command and control exercise, which demonstrated the crew's ability to execute the mission and accomplish all required tasking. The second major certification was demonstration and shakedown operations (DASO), which validated both the ship's strategic systems and the crew's ability to effectively operate the strategic weapons systems. During this certification, Nebraska successfully launched two Trident II D5 missiles off the coast of San Diego. Finally, Nebraska crews completed a nuclear weapons acceptance inspection, which certified the crew could safely, securely, and effectively maintain the strategic weapons system. "Restoring a submarine to service is one of the hardest jobs we ask a crew to accomplish," said Tilbrook. "Nothing is routine. Everything has to be done for the first time. It is imperative that best practices and lessons learned be factored into everything the crew does, so they can reach the fleet's high standard for performance as quickly as possible. Nebraska's blue crew has done a fantastic job returning to strategic service. During inspection after inspection and through all of their return to service certifications, they have been knocking it out of the park. The launch of two ballistic missiles during their certification was performed flawlessly and showed that Nebraska was back and ready to join the rest of the SSBN submarine force to ensure our nation's strategic deterrent remains credible." The mission of the SSBN force is strategic deterrence, which is the act of deterring a nuclear attack with a safe, secure, and effective nuclear-deterrent force. SSBNs serve as an undetectable launch platform for submarine-launched ballistic missiles. They are considered the most survivable leg of the strategic deterrent triad; the others legs being long-range manned aircraft and land-based intercontinental ballistic missiles. "The successful completion of this deployment highlights the outstanding dedication, hard work and teamwork among the Nebraska crew, the civilians and Sailors from Puget Sound Naval Shipyard, Trident Training Facility, Strategic Weapons Facility Pacific, Intermediate Maintenance Facility and Submarine Squadrons 17 and 19," said Rear Adm. Blake Converse, commander, Submarine Group 9. "Our ability to maintain a strong, credible nuclear deterrent is a key element of U.S. national security and the security of our allies and friends. Strategic deterrence is our nation's highest defense priority, and Nebraska's return to strategic service was vital to upholding the Navy's commitment to that mission." The keel for Nebraska was laid July 6, 1987. Since the boat's commissioning, Nebraska has completed 63 strategic deterrent patrols. 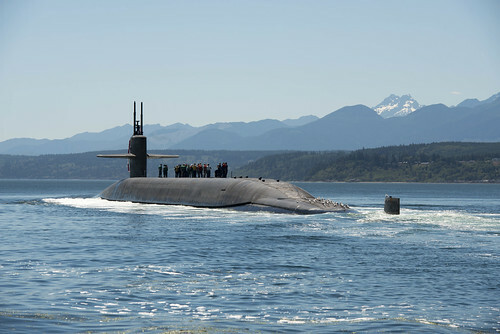 Nebraska is one of eight ballistic-missile submarines stationed at Naval Base Kitsap-Bangor.